Beatles Yesterday and Today First State Butcher Cover Stereo LP (Capitol 2553, 1966). 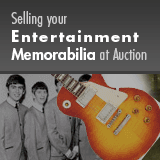 A very nice copy of what's arguably the most famous -- or infamous -- single item of Beatles memorabilia. Released in the US in 1966, in-between Rubber Soul and Revolver, this original cover for the Yesterday and Today album caused such a stir before hitting retail markets that virtually all copies were pulled before the public could get buy one at retail outlets. (The Beatles didn't know the photo was being used as an album cover, and it wasn't available anywhere other than in the US.) The cover in "First State" (not censored by a paste-over, which is how many copies were dealt with) is rare, especially the stereo version, and this one is in EX-7/NM-8 condition.